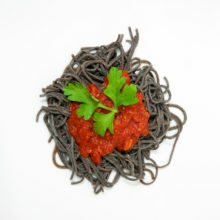 In continuation of Kelly’s post about healthy pasta alternatives, I have to share my go-to dinner of Explore Cuisine Black Bean Spaghetti with Classico Tomato and Basil Sauce. I like to save this meal for a night when I work late since it only takes about 10 minutes to prepare. Since the spaghetti is made from only black beans, one serving provides 25 grams of protein, which means you don’t have to prepare any other protein source. Of course there’s nothing like homemade tomato sauce, but if you don’t have time to make your own, the Classico Tomato and Basil sauce is a great and healthy alternative with no added sugar and tastes delicious. This meal has the nutrients to keep you full hours after you eat it thanks to the high fiber and protein content. Give it a try, it will not disappoint!